Catalog > RARE Vintage Ginny Baby "Can-Can Suit"
From my own childhood is this adorable 1959 Vogue 18" Ginny Baby "Can-Can Sunsuit" #7460. It's one of the few remaining pieces I have from my childhood baby-dolls that were packed away for years and now have found new homes. The susuit is in excellent, clean, played-with condition made of a light turquoise/teal and white plaid print and white organdy ruffles. Note: The dark areas are not dirt, but rather shadows from the camera. 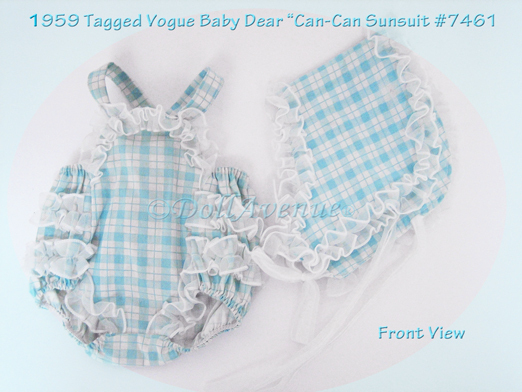 The outfit is tagged with the Vogue Dolls Inc. script tag on the inside of the sunsuit. This adorable outfit can be seen on page 332 of the Collector's Encyclopedia of Vogue Dolls 2nd Ed. by Izen and Stover and rarely is seen on the web.